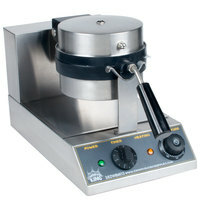 Double your business with this Carnival King WBM26 Double Belgian Waffle Maker with Timers - 120V! 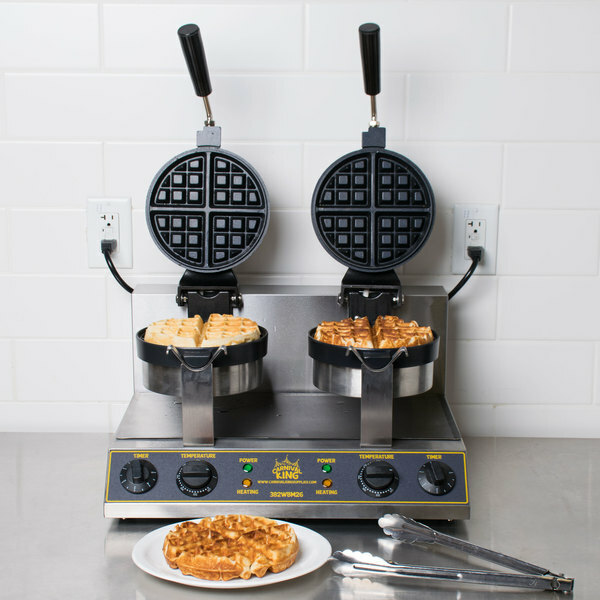 Great for busy diners, cafes, and hotel breakfast bars, this double belgian waffle maker is the perfect solution to keeping up with hungry customers! Built with durability and simplicity in mind, this unit is designed to keep your kitchen running smoothly and efficiently! "This waffle maker is terrific for our Culinary Arts class. It allows 2 students to create their batter, cook their waffle, and plate it. It allows 4 students to eat since we split the waffles in half. It is quick and simple to learn. Our students appreciate this product. 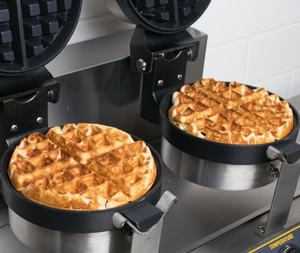 Waffles…"
Thanks to their non-stick coating, these aluminum grids prevent batter from getting glued to the surface, allowing you to form the perfect waffle up to 7 1/2" in diameter every time. There's nothing worse than cooking one side of your waffle to golden perfection only to be left with the other side under cooked. 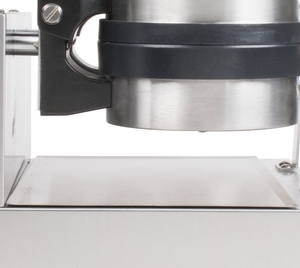 With the ability to rotate this unit 180 degrees, you can be sure you're cooking each waffle evenly. 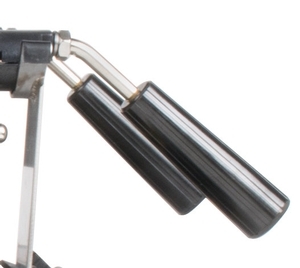 Not only are these handles designed to be easy-to-hold, but their cool-touch qualities also help prevent accidental burns, making them a safe option in your kitchen! 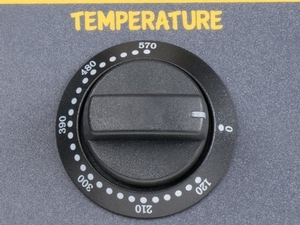 With temperature from 120 to 570 degrees Fahrenheit, you can easily adjust the dial to your exact specifications for light to golden brown waffles. 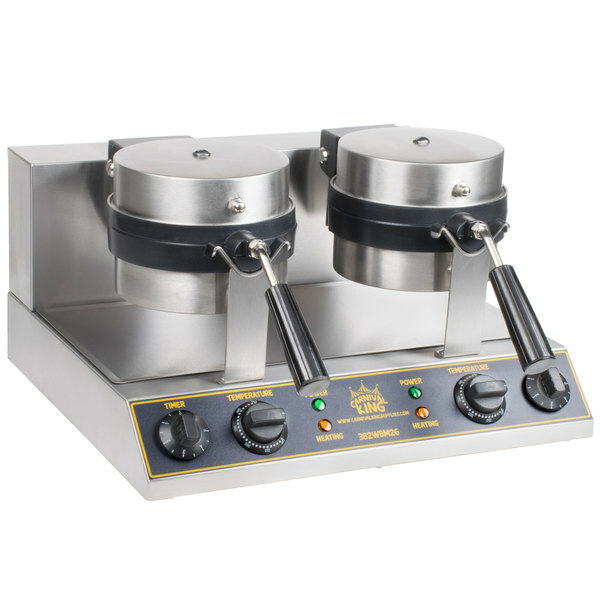 With separate power and heating indicator lights for each side, you can utilize both sides during a busy rush and drop down to one side only during slower service hours. 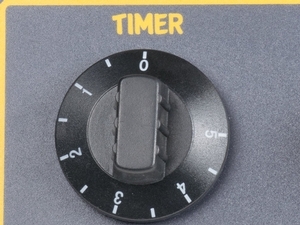 With an audible timer, you can set your waffle maker for up to 5 minutes and walk away to complete other tasks. 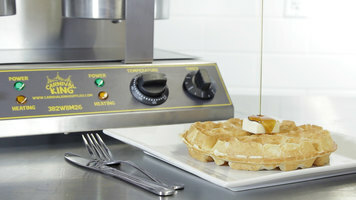 The audible "ding" will let you know when your waffle is cooked to perfection and ready to be plated. Conveniently located beneath the bakers, this drip tray is great for catching any spilled batter or cooked waffle crumbs. Just remove the tray and wash it after each shift to keep your work area clean and organized. Great for busy diners, cafes, and hotel breakfast bars, this waffle maker bakes 40 waffles per hour to keep up with your busiest rush. 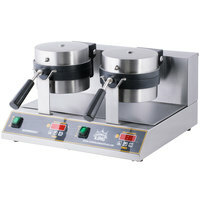 For best results, the recommended time and temperature setting is 400 degrees Fahrenheit for 2.5 minutes. 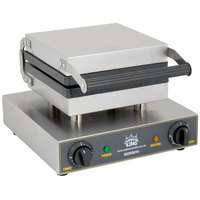 Can I use oils or sprays on my non-stick waffle iron? To prevent food from sticking to your non-stick surface, we recommend lightly coating it with oil, wiping off any excess with a soft cloth or napkin or using Vegalene Waffle-Off Grid Iron Release Spray. While other sprays can actually cause food to stick more readily, Vegalene Waffle-Off Grid Iron Release Spray is made to work with regular or non-stick waffle irons alike! Can each of this unit's power cords be plugged into the same outlet? They can be plugged into the same 20 amp GFCI outlet, but cannot be plugged into the same 15 amp GFCI outlet. 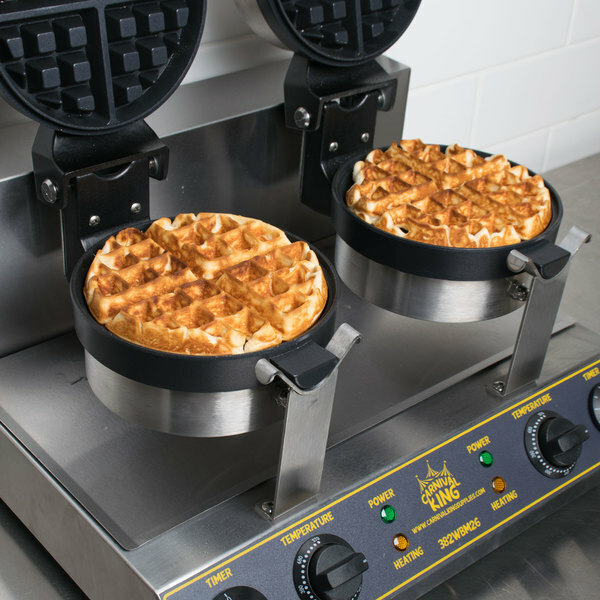 Use this Carnival King dual Belgian waffle maker to produce up to 40 waffles per hour! 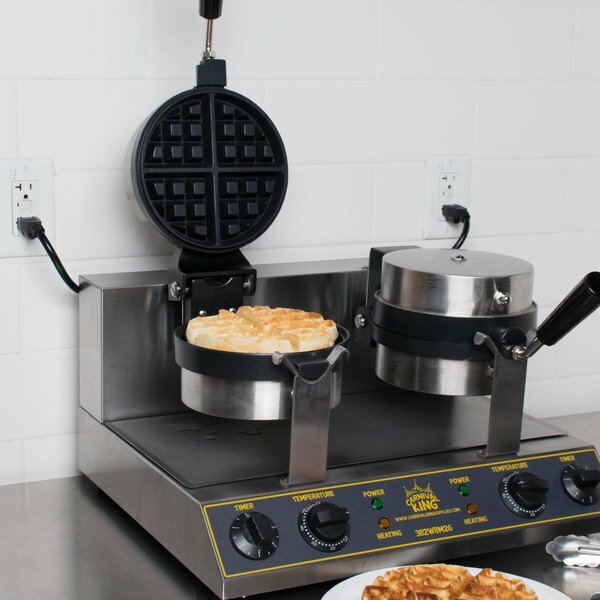 It utilizes light signals to let you know when it is heated up and boasts an audible timer, so you always know when your waffles are cooked to perfection. Cook fluffy Belgian waffles at your restaurant with the Carnival King double Belgian waffle maker! 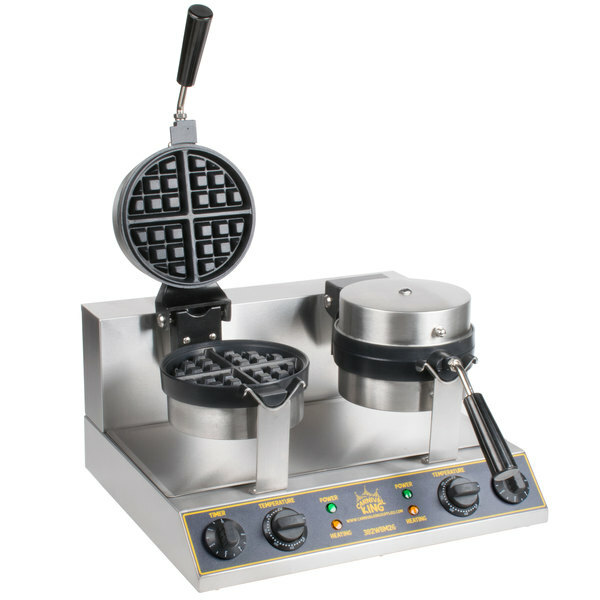 It features 2 independently operating sides with non-stick, 180 degree rotating grids, so you can cook 2 waffles at once and produce up to 40 waffles per hour. Each side has 1300 watts of heating power and the temperature is easily adjustable up to 570 degrees Fahrenheit. A green light on the unit lets you know when it is powered on, while the orange light lets you know when it is heating up. It comes with a convenient 5 minute audible timer, so you can set the time, close the baker, and carry one with other kitchen tasks. 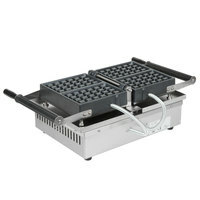 The heavy base and non-skid feet ensures that this unit will stay in place when in use. 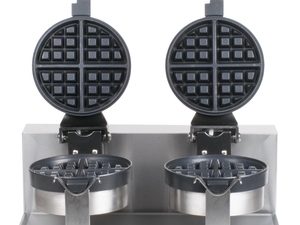 Make the most with your counter space with the dual design of this Carnival King Belgian waffle maker! It requires 120 volt electrical connection, comes with 2 cords, and NEMA 5-15 plugs. This unit is also CE Listed. RESIDENTIAL USERS: Vendor assumes no liability for parts or labor coverage for component failure or other damages resulting from installation in non-commercial or residential applications. Thank you for the review, Jason. We are so sorry to hear that this waffle maker has caused issues for you! 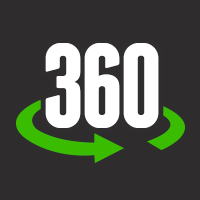 A Customer Solutions Representative will contact you about this soon! Garbage. Second one in 5 months. The right side unit keeps going out and there's no customer support number to call to figure out how to replace the thermostat. Thank you for your feedback! 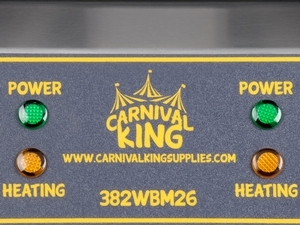 We are sorry your Carnival King WBM26 Non-Stick Double Belgian Waffle Maker with Timers - 120V was defective. Corrective action has been taken and a Customer Solutions Representative will remain in contact with you about this. I just bought these irons a couple weeks ago. The first one I received had scratching on the nonstick coating. WebstaurantStore replaced without hesitation and the second unit works great. It heats fast and works well. The only reason I gave a four star is because it’s kind of hard to clean and the built in timers aren’t very sturdy. They stick in place and don’t count down sometimes. Other then that it’s a good product. The top left plate rotates left and right. I have tried to contact customer service and they just don't seem to understand. Was going to just replace the plates but they have been on back order for a while. I gave it 2 stars because the iron seems to work but quality and customer service just seems to be lacking. 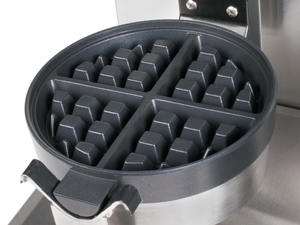 We LOVE this waffle iron. The income it has generated has easily paid for it. People love waffles and we've started Waffle Weekend, serving waffles at our coffee shop from 8 - noon on Saturday and Sunday. The reason it loses a star is because it is so very hot and we've gotten burns. It also takes up a huge amount of counter space and needs to use two outlets. Belgian Waffles at their best! 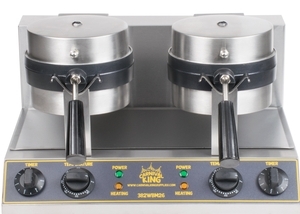 the Carnival King WBM26 Non-Stick Double Belgian Waffle Maker with Timers - 120V will meet any busy demand from the coffee shop! Despite other reviews, I've been happy with this waffle maker. We only use it during brunch, but it bangs out some great waffles. Not too easy to clean. This waffle maker is terrific for our Culinary Arts class. 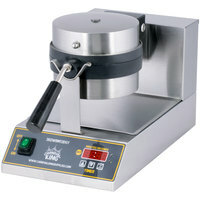 It allows 2 students to create their batter, cook their waffle, and plate it. It allows 4 students to eat since we split the waffles in half. It is quick and simple to learn. Our students appreciate this product. Waffles with strawberries are their favorite! This is a great waffle maker. After playing with temperature controls, our waffles come out great. Easy to clean and easy to use. Also very sturdy for what we're producing.